The Tabard Theatre is presenting a new show, Uptown Holiday Swing, November-December 2018, created by Cathy Spielberger Cassetta & Gus Kambeitz. 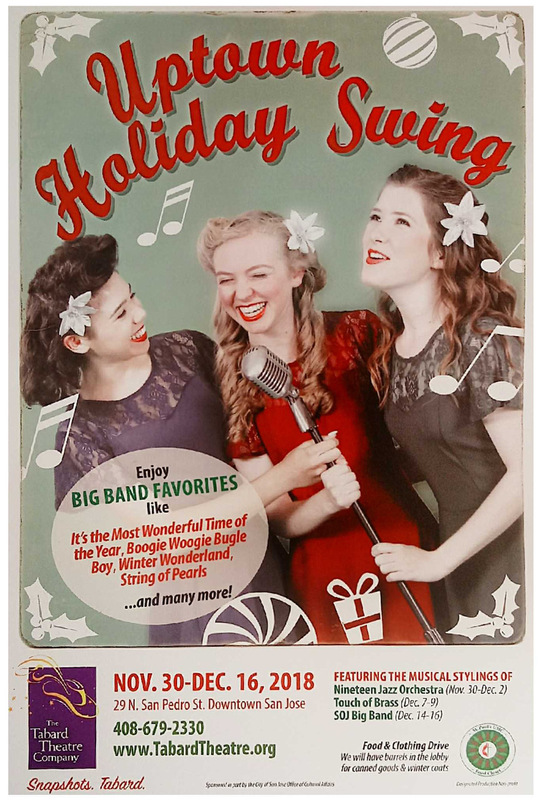 Bringing the 1940s’ sounds of New York’s Uptown Swing to Downtown San Jose, this musical feast of Big Band swing standards and holiday classics celebrates the jazz styles popularized by the likes of Benny Goodman, Glen Miller, Cab Calloway, Duke Ellington, Ella Fitzgerald, and Frank Sinatra. If you liked Holiday at the Savoy, you’re going to love this show! Free swing dance lessons are offered before each show! When you buy your tickets, remember to click the box and tell them SOJ Big Band sent you!